Whilst on tour with my mother and brother in Japan and Hồ Chí Minh City during the latter half of January, I had an attraction to something I had looked at a few years ago in a less serious manner: travel warnings. Although my mother and brother have no interest in remotely risky destinations, I often do – indeed many I can find very interesting due to the cultural differences and the fact that many have ecological traits either very different (e.g. Afghanistan) or quite similar to Australia itself. It was very frequent during the holidays that I would – although always quietly – tell my mother and brother about these “Do Not Travel” warnings that I noticed from the Department of Foreign Affairs and trade (abbreviated to DFAT). My mother and brother would say there was little of interest in most “Do Not Travel” destinations, although my knowledge of linguistics and ecology make it tough to agree. Australia’s DFAT is not the only group who published travel warnings (and advice for less inherently risky destinations). The British Foreign Office, Global Affairs Canada, the U.S. Department of State, and sites in Ireland, Taiwan, Japan and other European nations also produce travel warnings for dangerous regions of the world. Of these, I have studied most extensively Global Affairs Canada and the British Foreign Office – indeed it was those and not DFAT that I based my early studies of the topic upon. Whilst I was travelling in Japan, it occurred to me that DFAT often had “reconsider your need to travel” in areas where the British Foreign Office seemed to be simply giving the normal “See our travel advice before travelling” (the lowest warning). My mother and brother have disputed this, and also disputed my attribution of the difference to Australians’ inherently greater risk aversion from living with an exceptionally variable hydrology compared to the Enriched World. For this reason, I have decided to compare DFAT’s travel warnings with those of the British Foreign Office on a country-by-country basis. I have chosen the British Foreign Office because, unlike Global Affairs Canada, it has really accurate maps of what regions – not merely what countries – should be avoided. Here, we can see that DFAT is stricter than the BFO in its travel warning. The advice of “reconsider your need to travel” for Papua, West Papua and Central Sulawesi provinces is absent from the BFO warning. Here, though it’s a little harder to see, we again see that DFAT is more cautious (rigorous) than the BFO. 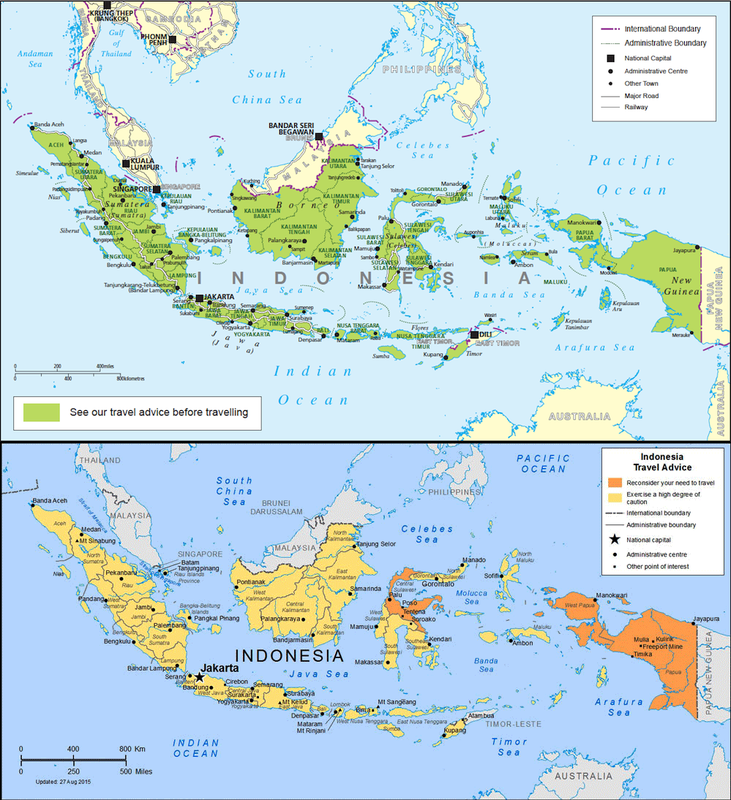 The region of highest warning – “advise against all travel” for BFO and “do not travel” for DFAT – extends further north in the DFAT map on the right than it does in the BFO map on the left. The provinces of Zamboanga del Norte and Misams Occidental are given an advisory against all but essential travel by the BFO, but a highest-level “Do Not Travel” by Canberra’s Department of Foreign Affairs and Trade. India – the next country I would have done – does not unfortunately have a proper BFO map to compare. It’s interesting, though, that some other nations list higher-level “Avoid All Travel” warnings for the state of Manipur in the northeast, which has only the second-highest “Reconsider Your Need to Travel” from DFAT. Pakistan has similar problems, but here DFAT is much stricter than the BFO. DFAT advises to at least “Reconsider Your Need to Travel” for all of Pakistan, but BFO does not except for the most inherently dangerous regions. In Nepal, a country where a longstanding monarchy (dating back to the eighteenth century, as Nepal was never colonised due to its extreme terrain and absence of natural resources) has been overthrown, travel safety has improved in recent years as political tensions ease. 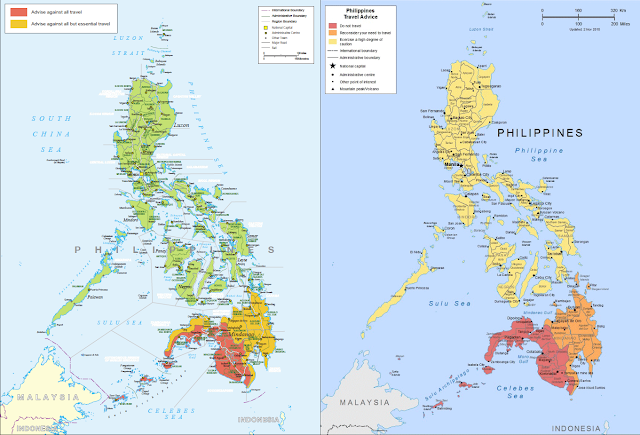 The maps however do show that, as in the Philippines and Indonesia, Australia’s DFAT offers higher (stricter) levels of travel warning than the British Foreign Office for many localities. In the case of Nepal this is the Terai region in the south of the country, which the British give no special warning to but which DFAT lists as “Reconsider Your Need to Travel” due to political protests beginning in summer 2015. Afghanistan, for a long time unsafe to visit (without noting strongly that Taliban hostility to non-Muslims would have excluded tourism even had conflict ceased) is shown above. Again, for the third time out of three maps, we see that DFAT has the severest “Do Not Travel” warning for all of Afghanistan, but the BFO has only the second-highest “Avoid Non-Essential Travel” for most regions north of the Hindukush and the ranges to the west. Iraq is another nation that has long been unsafe to visit – were it safe with its long history and perfect winter climate of 15˚C days it would actually be a quite interesting place to visit, though of course not during the dreadful summers that average over 40˚C even in the north. Looking at the map above, one sees exactly the same pattern as for Afgahnistan. 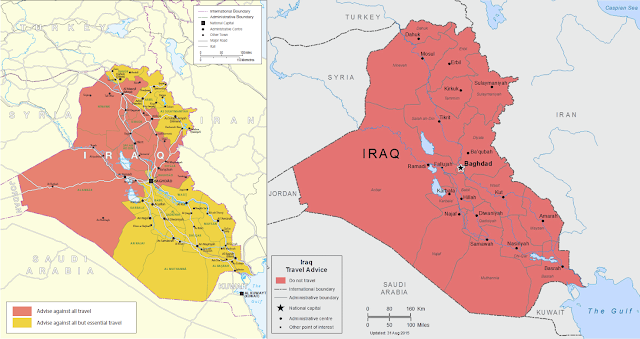 Australia’s DFAT advises to avoid all travel to the whole of Iraq, whereas Britain’s Foreign Office allows for essential travel to the south and the northeast. The northeast of Iraq is controlled by the Kurdistan Regional Government, and the south is far from the danger of ISIS, so authorities in London do not consider it as dangerous. In Turkey, which is considerably affected by the trouble in Syria and Iraq, we see than DFAT is again more restrictive than the BFO – although the difference is less than with Iraq or Afghanistan probably because western and northern Turkey remains safe or relatively so. The provinces of Bingöl, Muş, Van, Bitlis and Batman are listed as “reconsider your need to travel” by DFTA but as “see our travel advice before travelling” by the British Foreign Office. In Georgia, we see only a very slight difference between BFO and DFAT – so slight in fact that one could count the country as a “zero” rather than as a “positive one”. DFAT does suggest a high-risk zone around the Pankisi Gorge due to landmines, but BFO does not. In Syria, which Lonely Planet’s old Middle East on a Shoestring said back circa 2000 was “an extremely safe country to visit”, conflicts in Iraq since the fall of Saddam Hussein and struggles with the Bacathist Asad regime have made the country quite off-limits to visitors. As can be seen, there is an absolute warning to avoid all travel to the whole of Syria by not only the Australian and British foreign affairs departments, but also by others. 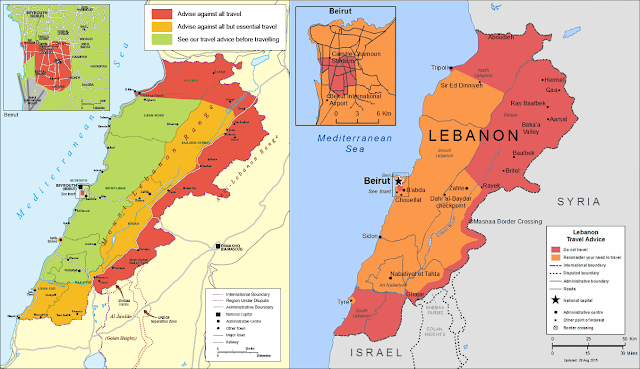 In Lebanon, a country long affected by all the conflicts found in the Middle East, there has for a long time been a major threat from Muslim terrorism, especially from Hezbollah, sponsored by the Shicite fundamentalist regime in Iran. Yet again, we see DFAT offering severer travel warnings than the BFO: according to DFAT travel to all regions of Lebanon must be reconsidered due to high risk, whereas the BFO lists only the border areas and certain parts of Beirut as high risk. Saudi Arabia, as most will know, has always largely restricted entry of non-Muslims to workers or business travellers (“essential” travel). This should in theory reduce distinctions required within a government travel warning. However, as we can see, this does not apply. DFAT still places a “reconsider your need to travel” warning upon all of Saudi Arabia, and the BFO also distinguishes between “essential” and “non-essential” (on organised tour or transit visa) travel. Moreover, with Saudi Arabia the difference between BFO and DFAT is very clear. DFAT says the need for travel to all of Saudi Arabia must be carefully considered, whereas the BFO applies this only to areas close to the Yemeni border. In addition, the area near that border with the strongest warming (“avoid all travel” or “do not travel”) is much wider in the DFAT map, where it extend for thirty kilometres versus only ten in the BFO map. The spread of the al-Qacida terrorist group into Yemen – where it now conducts most of its operations – means that the travel warnings for Yemen in most OECD nations are the same: “Avoid All Travel”, “Do Not Travel”, or its equivalent. There is no difference between BFO, DFAT or any other one. In our next posts we will compare Africa and the Americas to see whether this trend is also apparent there, and then think about how one might account for the observed results. A amazing picture for a Christian? !